Flying Colors a brand new 5 reel, 20 payline video slot with a war aerial theme decorated with medals of bravery, fancy pilots and surrounded by enemies approaching from all sides and zeppelins dropping bombs. This slot is one of the latest addition to the Rival family and it is loaded with some exciting features icluding a great bonus games and free spins that allows the players to win extra prizes. 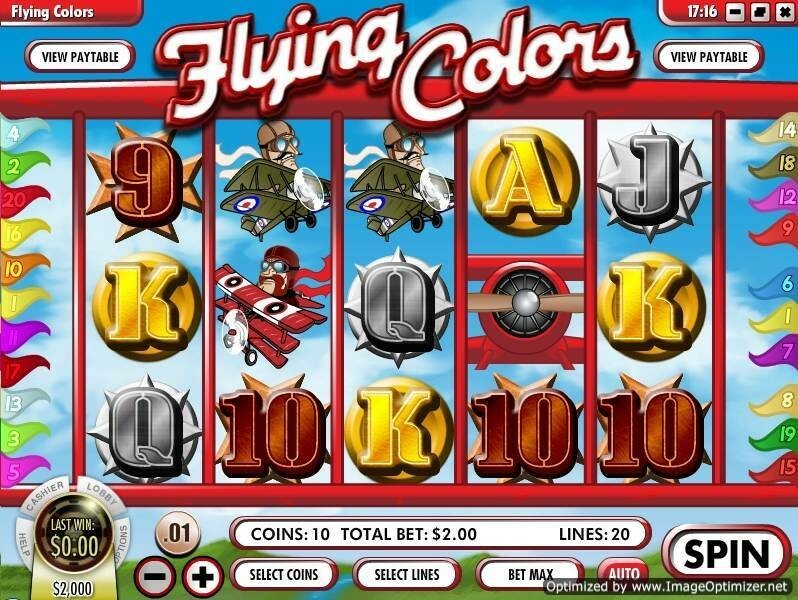 Flying Colors slot has more than 32 winning combinations with various winning symbols such as the Propeller symbol as the scatter, the Zeppelin as the wild (it substitutes for all other symbols except the propeller scatter symbol) and Crimson Kaisers as the Bonus symbol. Other paying symbols are Woman symbol and the high valued playing card symbols. There is a Wild Symbol in the form of a Zeppelin airship. Whenever a symbol of the Zeppelin appears in a spin, it will be replaced for any other symbol of the paytable in order to help you get the highest paying combination. The Flying Colors presents one of those special free spins where players can’t lose. Once activated, every free spin is guaranteed to deliver a win. To activate the free spins, player must get at least 3 propeller symbols in one spin. Getting the minimum in a spin (3) will activate 7 free spins, while getting 4 triggers 14 free spins and getting all 5 propellers activates 25 free spins. The wild icon will be held steady in the first reel and this allows every spin to get a jackpot. Additionally, all free spins wins will be multiplied x2. So, simply look at the paytable chart and double it during free spins. With coin betting range of 0.01 cents to $0.25 and being able to play up to $50 maximum bet per spin this slot game is suitable only for penny slot players. It was released on May 18, 2010.